A public meeting is being held on Wednesday January 28th to revive Conwy Civic Society. The society began in 1966 and was founded to defend the built environment of Conwy, Llandudno Junction and Deganwy. After many years the society has ceased to operate , a group of local people hope to find fresh input and support at a public meeting at 7 pm on Wednesday, January 28, in Conwy’s Guildhall. Conwy Civic Society, which has the support of Conwy Town Council, has historically monitored planning applications and suggested improvements to plans. 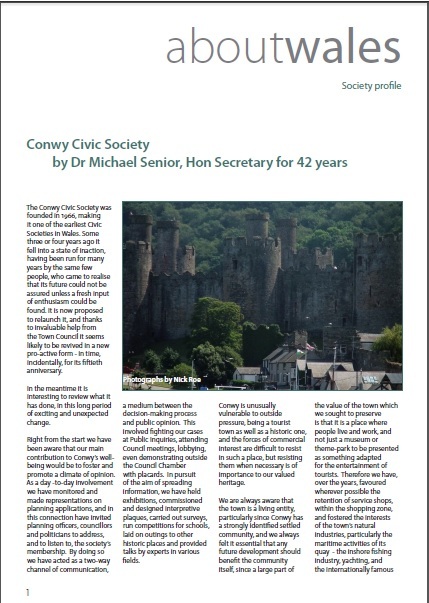 It has acted as a channel of communication between the decision-making process and public opinion, as well as fighting cases at public inquiries, attending Conwy County Council meetings, lobbying, and even demonstrating outside the council chamber. It has also held exhibitions, carried out surveys, run competitions for schools, arranged outings to other historic places and provided talks by experts in various fields. ‹ Get your responses on the Planning Consultations into Welsh Government asap! Surely this is January 28th not 27th? Yes absolutely. Many thanks Nick for spotting the mistake! Now corrected..